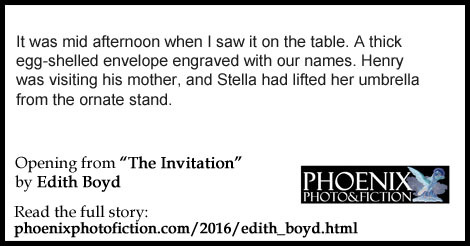 Phoenix Photo&Fiction - "The Invitation" by Edith Boyd. her umbrella from the ornate stand. "Mrs. Palmer, I left dinner instructions next to the fridge." deeper than my not being gourmet. expressive, as if conducting an orchestra. Few of us missed her class, finding in her a spark of child-like delight. captured, a sliver of hope that he felt the same way. many times, that I was mute when he spoke, thinking it another daydream. watched him go to his car, after tilting his head toward it. apology, acting, if not feeling, as if I deserved his attention. here?" as he screeched his bike to a halt near us. "Evening school, Dylan. him one of those looks I came to know, and Dylan cycled away. It was Maureen whom I called, the most romantic of my sisters. "He's not married, is he?" she said, after her initial joy. "I doubt it,“ I said savoring the way he brushed my arm. I knew by then, was Henry's first wife. asked me if I had a brother or sister. Was the question cordial and innocent? answered that I had three of each. wincing when they said " Eileen." frittered away my time, causing Stella to repeat her deferential requests. "Mrs. Palmer, may I mop the kitchen floor now?" caste system that had thoroughly screwed with my head would not allow it. fun? Probably not, but my wiring wasn't that of a pioneer. told her about the wedding invitation, and voiced some feelings about it. 'Eileen, you've got to clear your head of this stuff." "Mother and Daddy worked hard to educate us. We can hold our own with anybody. Where did you get this serf mentality?" between us. It was like that with my sisters. All of them. bothered me in ways I chose not to voice. made my way into the kitchen. visualizing the slinky black dress I would wear to J.D. 's wedding. notice, but stumbled into a swinging rack of dresses. she knew fear although she chose to go on offense to dispel it. My M. O.
yet again, about my name. "Ginny, it's been a while." Smiling at Ginny, I backed out of Becker's Dress and headed for the mall. date, so I could meet so many friends of his from his younger days. modeled the dress for him, I was able to break his concentration. black granite ledge of the sink. see what I saw in Henry in the first place. Just after re-gaining my balance, the land line rang and I answered it. "Eileen, this is Jean Palmer. How are you?" she said. "Good. And you?" stopping myself from calling her Mrs. Palmer. "She's just leaving. I'll get her, Mrs. Palmer," I said, slipping back. It wasn't my fault, as the Jean thing was new. accompany Mrs. Palmer to the wedding that was the source of my frenzy. Henry's mother no longer drove, and she felt comfortable with Stella. Palmer, elevated her status in the family. scolded myself for having given the bride and groom so little thought. The parents of the groom were chatting in the foyer of the Episcopal church. Jay strode over to us, and actually hugged Henry. "Let's not lose one another again," he said to Henry, while releasing him. dress like a petite model giving boring taupe a second look. of the few people I knew was Ginny Sawyer. Stella would be bringing Mrs. Palmer directly to the reception. to meet, was beaming at the altar, assuring me that this was a happy event. Barbara or of the Ivy League set. nobody there to help me, so I fumbled through the jackets to find it. each syllable to hide her consumption, but I heard every slurred word. "Bet that little tart has you missing Barbara," she said. "Ginny, Eileen is a fine woman, and she loves my son. You should behave more like her," Mrs. Palmer said. than enough to sustain me. Henry peeked into the coat room. "Eileen, I missed you," he said. World," and other short stories. She lives in Jupiter, Florida.